TPS Race 1: Race pack collection – What's in the racepack? | JustRunLah! The race pack collection for The Performance Series Race 1: Coney Island/Punggol Waterway was held at City Square Mall. The location is rather convenient in my opinion but the area where we collected the race pack within the mall is quite inappropriate, mainly because it was rather hot and stuffy at certain parts of the queue. I reached the area about 11.05 am and was shocked to see that there was already a very long queue of people waiting to collect their race pack. The collection was supposed to start at 11 am by the way, but the organizers saw the long queue and decided to start earlier. Kudos to that, because if not, my waiting time would have been longer than it already is. The queue was rather slow at first but it soon picked up pace as the volunteers began to get use to the routine and worked faster to clear the crowd. There’s also updates on FB informing of other runners who are planning to head down about the length of the queue, which I thought was really nice of them. Anyways, I didn’t have to queue very long for my race pack but there was one thing I felt that the organizers could improve on though. The volunteer who packed my race pack only checked with me the size of my shirt and then placed the shirt and race bib into the bag. After receiving my pack, I stood there to take out the race bib to check for the particulars and whether they are right or not. Although this can be considered as the responsibility of the runners to check, I think it would be better if they are allowed us a chance to check our particulars before the volunteers place them into the race pack to save time and if the race bib is not ours, we can change it immediately. Everything in the race pack! Collection of race packs always gets me so excited! It’s like receiving a present and I can’t wait to check out what’s inside. 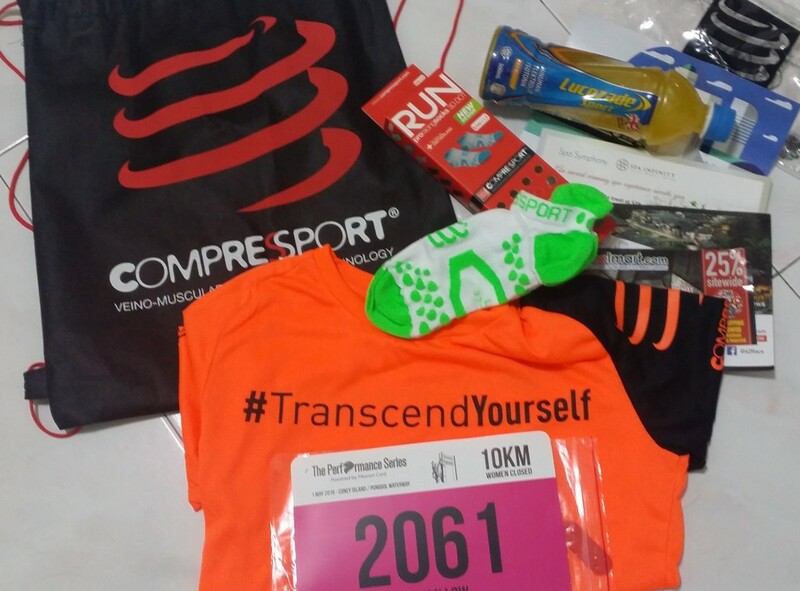 So what I’ve got in my 10km race pack is a draw string bag from Compressport containing my run tee, race bib, a pair of compressport running socks (which my boyfriend commented saying that it resembled the feet of a gecko due to the green spots), some vouchers for online shopping, Uber discount and spa/sports massage and the sport drink Lucozade (I have yet to try the sport drink though). I have yet to try the socks yet and I’ll probably try it during one of my practice runs prior to the race itself on 1st May and maybe I’ll give a product review and talk more about it. The information behind the packaging makes the product looks quite promising though! I miss the race pack collection for race 4. Any advise how should I get it? Not able to locate the address. Just realized there are individual reply buttons to each comment hahaha so I’m hoping you would see the notification if I reply to your comment specifically! Hi, I’m not sure whether this race allows you to collect your race pack on race day itself. So I’ve attached the link for you to contact them.